Sega's latest Alien spin-off is ready to pounce on gamers, but will we enjoy being mauled by this beast of a game? This time the inspiration is Ridley Scott's original 1979 movie, as you play Amanda Ripley, the now-adult daughter of Sigourney Weaver's character. She heads to the space station Sevastopol when the flight recorder from the Nostromo is discovered, but finds that something else has hitched a ride on the salvage vessel. The Alien is a single creature, but it has a mind of its own, prowling the station at will, using its virtual senses to hunt survivors in an unscripted fashion. You can't kill it, only distract or hide from it. But what have reviewers made of this minimalist horror approach? It's a 93% score from PC Gamer, which says: The game the Alien series has always deserved. A deep, fun stealth game set in an evocatively realised sci-fi world. GamesTM calls it superb and the most terrifying game of the year, offering a 9/10 score. Videogamer.com, meanwhile, calls it a masterwork of atmosphere and environmental design and adds another 9/10 to the pile. It sounds as if Alien fans have finally got the game they've been dreaming of. 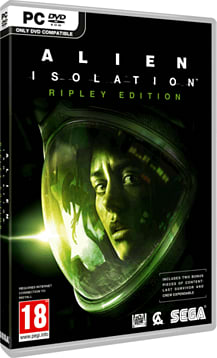 Alien Isolation is out from 7 October for PlayStation 4, Xbox One, PlayStation 3, Xbox 360 and PC.